Well after a fantastic first weekend of Heineken Cup rugby, we come to the final part of our big HC shirt round-up. We’re still hoping this isn’t the final time we get to do a Heineken Cup shirt round-up, but if it is, what better way to bid farewell to the finest club competition than with some taste shirts, eh? After making the final in 2011, Saints haven’t quite hit those heights again in the last few seasons. But with a strong recruitment drive and an impressive start to the season taking them into Europe this season, they’ll look to go deep into the competiton, provided they can get out of their pool of death with Leinster, Ospreys and Castres. We have mixed feelings about this Burrda kit. On the one hand, the harlequin design is rather nice, and a nice change for the fans, while still looking clean and traditional. On the other hand, that weird ‘alien’s face’ grip tape pattern, which we weren’t opposed to on the equally alien away shirt, looks hugely out of place here, and somewhat damages what is a very classic kit. On the whole though, it’s a pretty decent design, and just about emerges in the plus column. We were pretty taken, if not blown away, but Zar-X Sports’ first effort at the Zebre home shirt – it’s a nice blend of simple, clean lines and zebra-y goodness. This, on the other hand, is a bit um, well, it’s rather yellow, isn’t it? Zebras might be many things, but let’s face it, they ain’t yellow. We did a little bit of digging, and we’re pretty sure the colour scheme here is a nod to the flag of Parma, the Italian city that Zebre call home. The problem with this kit, for us, is that it’s a bit half-hearted. Yes it’s got zebra stripes subtly sublimated onto the front, but if you’re called Zebre, and you go zebra-stripey, you better go FULL ZEBRA, or not at all. I mean just look at last year’s Puma effort which went for the full ‘throw cushion in a South African game lodge’ look – THAT is what we’re talking about. This is just a bit too subtle, a bit too decent. There’s a weird wrinkle in this tale however. When the Italian teams did a photoshoot for the ERC launch last week, Zebre captain Marco Bortolami turned up wearing a shirt which was neither the home shirt, nor this Euro shirt. 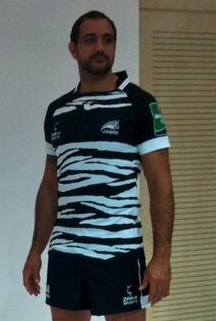 No instead what we had was a brilliant mix of FULL ZEBRA mentalness and effective shirt design. It’s like a hybrid of the last year’s Puma kit, the Zar-X home shirt, and the Euro shirt, and we love it. By keeping the sleeves and the chest strip black, it doesn’t look too busy, and keeps the whole thing looking pretty coherent, while still giving us crazy Zebra action. 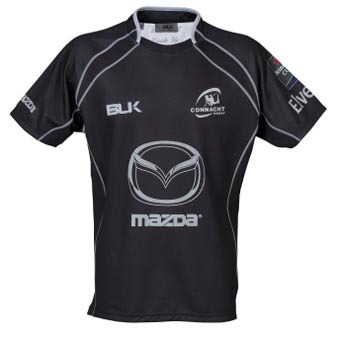 We don’t have any clarification from Zar-X about just what this kit is and whether it’s ANOTHER Heineken Cup shirt, an overhaul of the home shirt (mid-season!?) or something else entirely, but keep an eye on our Twitter feed, where we’ll clarify it as soon as we know. 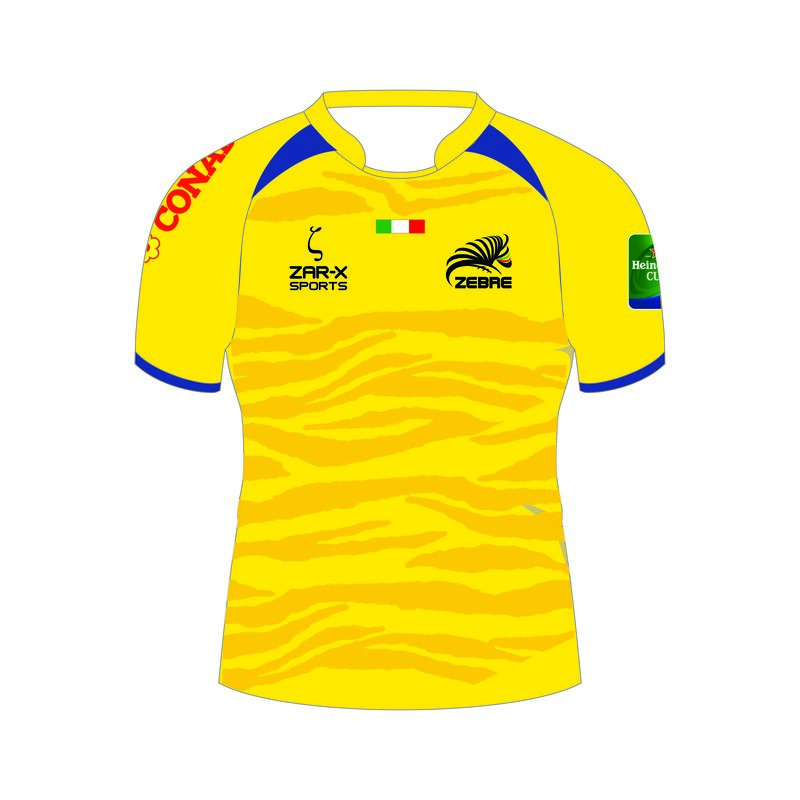 UPDATE: Zebre got in touch with us yesterday and explained that the team will in fact have TWO Heineken Cup shirts, the black and white home kit and the yellow away. Frankly, that’s a bit mental, but as they’re only offering the away shirt for sale, we guess they can’t be accused of rampant profiteering in the replica shirt stakes. The only issue we have is that the Heineken Cup home shirt is far cooler and more interesting than the league one – we think they should wear it all the time! We’ve been pretty impressed with what BLK have produced for Connacht this season. 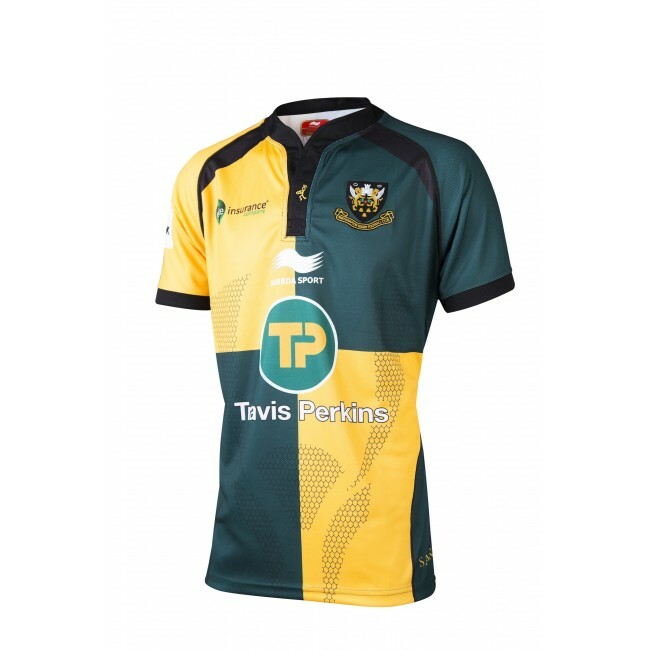 The Aussie brand is looking to make a foothold in European rugby, and if the three shirts they’ve come up with this season are anything to go by, they’re going to be one of the better designers. From the subtle yet stylish home shirt, to the modern but lovely away, through this very understated Euro shirt, there’s not a design there that we think Connacht fans will hate. We have to say though, that this shirt is probably our least favourite of the three. It’s perfectly nice, in the way that a five-door family hatchback (in similar dirt-reducing black) is. It’s perfectly inoffensive, but it hardly sets our pulses racing. 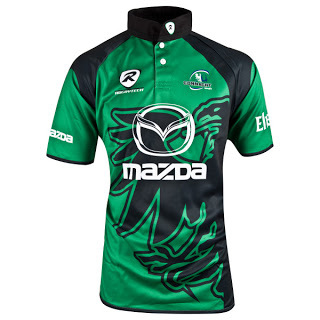 Given that their short history in the Heineken Cup, Connacht have given us a rather nice grey ‘n’ green effort (we’re such suckers for a grey shirt), and a striking ‘eagle all up in yo grille’ jersey, this is a bit subdued for our tastes – show us the crazy!